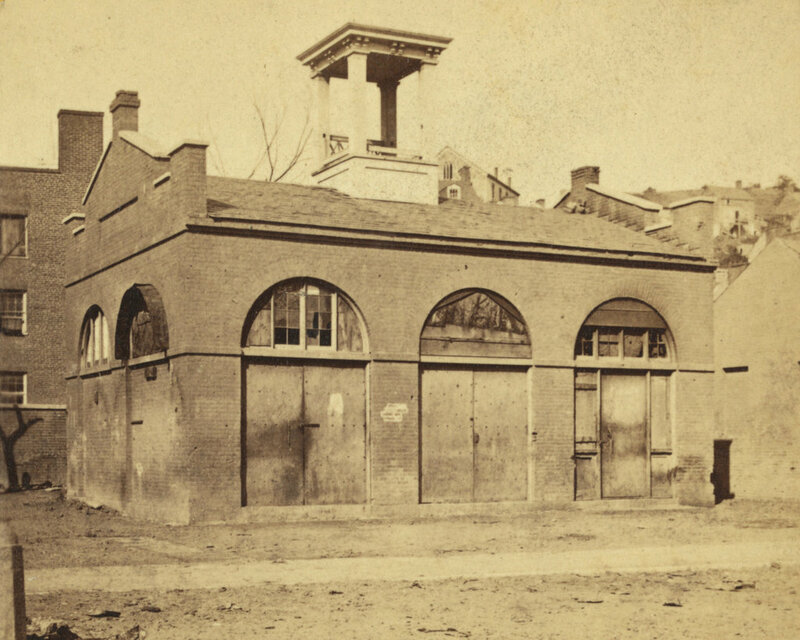 The fire engine house at the Harpers Ferry Armory, more commonly referred to as “John Brown’s Fort,” as seen around 1860. Image courtesy of the Library of Congress, Civil War Collection. The same view in May 1939. Image courtesy of the Library of Congress, FSA/OWI Collection. This small, seemingly nondescript building was built in 1848 at the entrance to the Harpers Ferry Armory, and was used as a guard house and fire engine house. Normally, such a building would not be the subject of an 1860s stereocard, but it gained widespread fame just a few years earlier, due to its role in John Brown’s raid on the armory. On October 16, 1859, northern abolitionist John Brown led a group of 22 men who attempted to take the armory and start a slave rebellion. They succeeded in taking the armory, and took a number of Harpers Ferry citizens hostage, but the plan quickly unraveled and they ended up barricading themselves in this building, surrounded by local militiamen and other armed townspeople. Eventually, Colonel Robert E. Lee, still fighting in the US Army at the time, led a detachment of Marines, who succeeded in taking the building and capturing John Brown and most of his men. To many northern abolitionists, John Brown was a hero, but to southern slaveowners he was a dangerous radical and a criminal. He was executed on December 2 in nearby Charles Town, but the failed raid helped to set the Civil War in motion a little over a year later. The first photo was probably taken within three years of the raid, and in it the building still bears some of the scars from the fight. Unlike most of the armory buildings, this one actually survived the war, and over time it became a tourist attraction and a symbol of the abolitionist movement. However, many residents feared that it would become a major draw for African-Americans to visit the town, so they were looking for ways to get rid of it. Finally, in 1891 the owners decided to dismantle the fort and reassemble it at the World’s Columbian Exposition in Chicago. It was a colossal failure at the exposition, though; the move cost $60,000, and just 11 people paid the 50 cent admission fee to view the fort. The fort underwent further dismantlings and reconstructions, before eventually moving to its present-day site about 150 feet to the right of here. However, it doesn’t have much real historic value, because of the number of times it has been reconstructed and the amount of original materials that has been lost over time. After the fort was moved from here, the Baltimore & Ohio Railroad built new railroad embankments through the site of the fort, so today it is at a substantially higher elevation than it was in the first photo. The monument, seen in the last two photos, was added by the railroad and marks the original location. 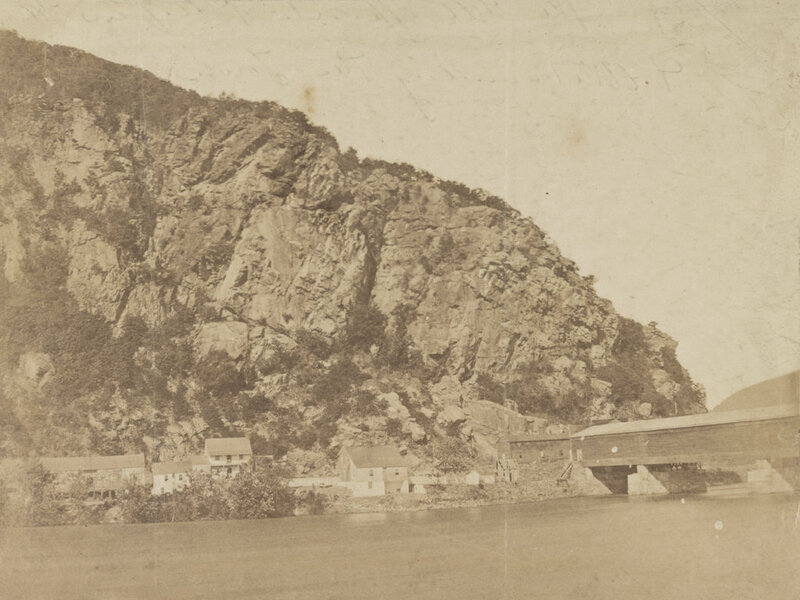 The town of Harpers Ferry, photographed around 1862. Image courtesy of the Library of Congress, Civil War Collection. These two views of Harpers Ferry are remarkably similar, considering how much damage the small town sustained during the Civil War. The Library of Congress estimates that this photo was taken around 1860, which seems a little too early. This photo is half of a stereocard from a series called “War Views,” and since the war didn’t start until 1861, it seems unlikely that it was taken before then. 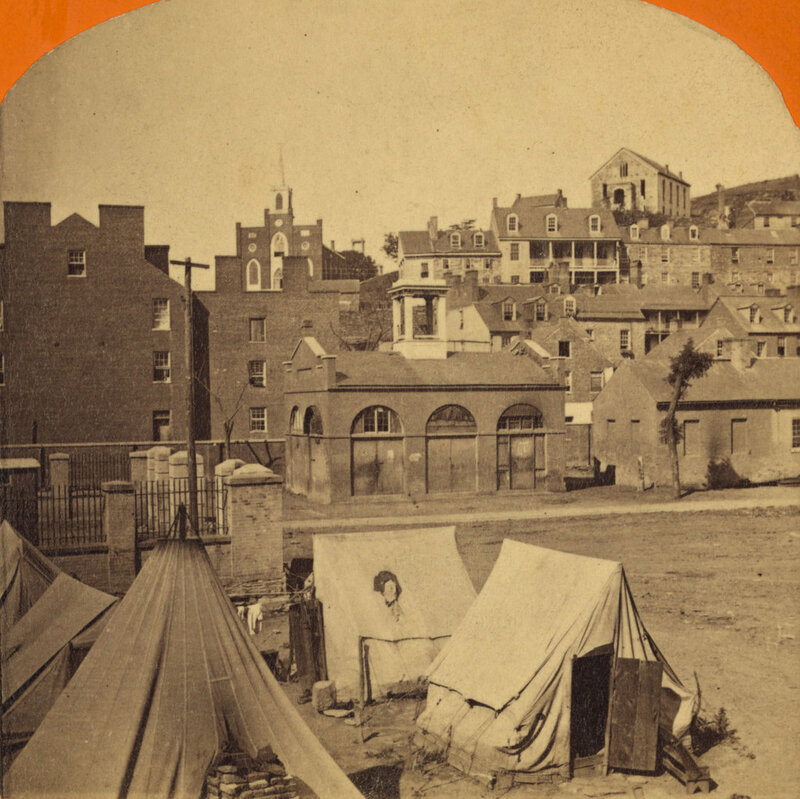 Instead, it was probably taken around 1862; the tents in the foreground were part of a “contraband camp” that the Union army established on the grounds of the former armory in March 1862 to house escaped slaves from the Confederacy. A number of notable buildings are visible here, with the most prominent being the Armory fire engine house, better known as “John Brown’s Fort,” seen in the center of the photo and explained in more detail in this post. 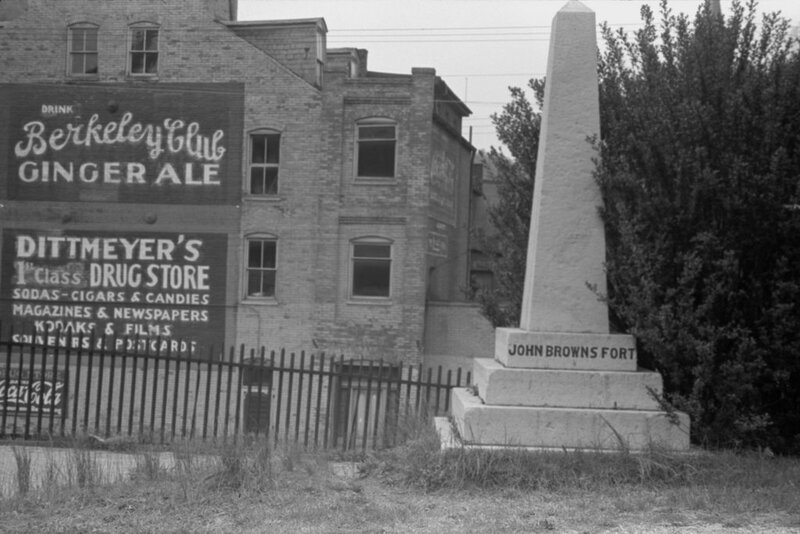 To the left of the “fort” is the Gerard Bond Wager Building, a three and a half story brick building that was completed in 1838. Prior to the Civil War it was used as a grocery and dry goods store, and it is still standing today and is operated by the National Park Service as a museum. Beyond the Gerard Bond Wager Building is St. Peter’s Roman Catholic Church, which was built in 1833 and is still standing today, although with some extensive alterations. It survived the Civil War, but it was renovated in 1896 to bring its exterior in line with the then-popular Neo-Gothic architectural style. The original brick walls were replaced with granite, the steeple was removed, and a new asymmetrical facade was built with a taller steeple on the left side. Another church in the original scene was St. John’s Episcopal Church, seen on the top of the hill to the right. It was built in 1852 and sustained damage during the war, eventually being repaired in 1882. However, it was subsequently abandoned in 1896, and today the picturesque ruins are still there, although they are hidden from view by the trees in the 2015 photo. The last of the prominent historic buildings in these two photos are the four in a row next to each other, seen just below St. John’s Episcopal Church. All four are still standing today, and the left-most of these is the Harper House, which is the oldest surviving building in the lower town. It was completed in 1782 by Robert Harper, the town founder who not coincidentally operated a ferry here. He died the same year it was completed, and it was later used as a tavern, a private residence, and by the start of the Civil War as a tenement house, accommodating up to four families. To the right of the Harper House is Marmion Hall, which was completed in 1833, and the last two buildings to the right were built in the 1840s as the Marmion Tenant Houses. These last two were, prior to the war, rented out to armory workers, who were just a short downhill walk away from their jobs. 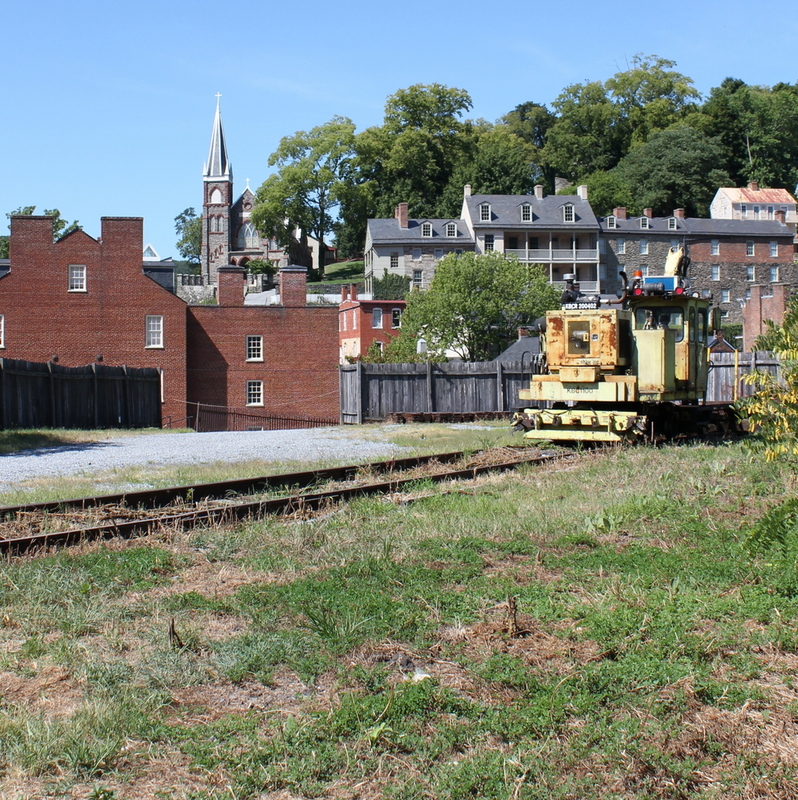 Today, railroad tracks cover much of the former armory site, and nearly all traces of the historic site are long gone. However, the town that grew up here because of the armory is, for the most part, preserved in its pre-1860s appearance. Much of the lower town is now part of the Harpers Ferry National Historical Park, and is run by the National Park Service. 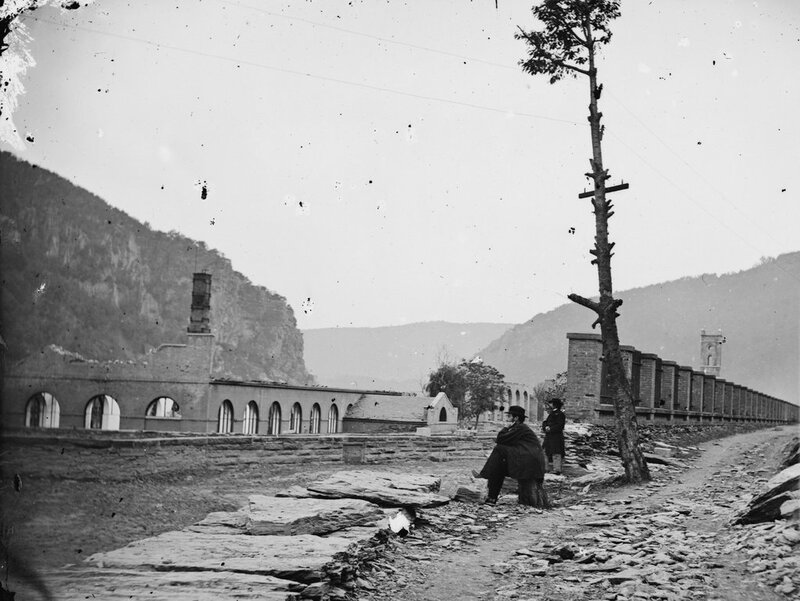 The ruins of the Harpers Ferry Armory, photographed in October 1862. Image courtesy of the Library of Congress, Civil War Collection. Prior to the Civil War, Harpers Ferry was the location of one of the country’s two federal armories, with the other being in Springfield, Massachusetts. Both sites were chosen by George Washington, and they had similar advantages. Harpers Ferry and Springfield are both located on major rivers at the intersection of major transportation routes, but they are also located above the head of navigation on their respective rivers, preventing a naval attack from a foreign enemy. In the first half of the 19th century, these two armories developed new ways to manufacture firearms, using machinery that mass-produced identical, interchangeable parts and that could be operated by unskilled workers. By the start of the Civil War, there were over 15,000 guns stored here, which helped entice John Brown to lead a raiding party in 1859. His goal was to start a slave rebellion by taking the arsenal and distributing the weapons to area slaves, and although the plan failed, it helped to spark the Civil War only a year and a half later. 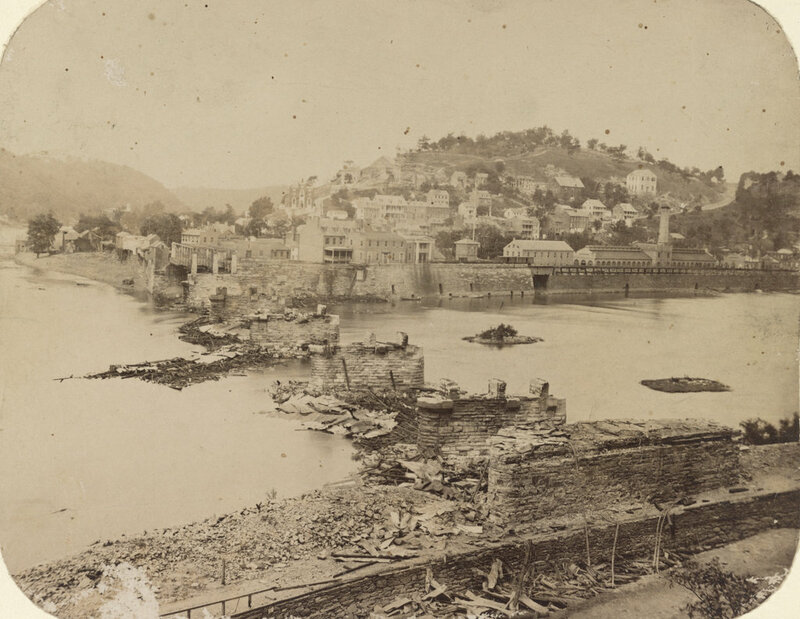 By the time the first photo had been taken in October 1862, Harpers Ferry had already changed hands a number of times in the Civil War, and armies on both sides had steadily destroyed the buildings in order to prevent the other side from making use of them. The ruins seen here are from the same building that can be seen on the right hand side of the 1861 photo in this post. Immediately on the shore of the Potomac, and extending back towards the town, lay the dismal ruins of the United States arsenal and armory, consisting of piles of broken bricks and a waste of shapeless demolition, amid which we saw gun-barrels in heaps of hundreds together. They were the relics of conflagration, bent with the heat of fire, and rusted with the wintry rain to which they had since been exposed. The brightest sunshine could not have made the scene cheerful, nor have taken away from the gloom from the dilapidated town; for, besides the natural shabbiness, and decayed, unthrifty look of a Virginian village, it has an inexpressible forlorness resulting from the devastations of war and its occupation by both armies alternately. The town became part of West Virginia in 1863, and things were relatively stable here until the end of the war. However, at that point the damage had been done. The pre-war economy of Harpers Ferry had relied almost exclusively on the armory, but it was never rebuilt following the war. The land was sold, and the Baltimore & Ohio built railroad tracks through part of the land, including the present-day railroad station, which was completed in 1889. 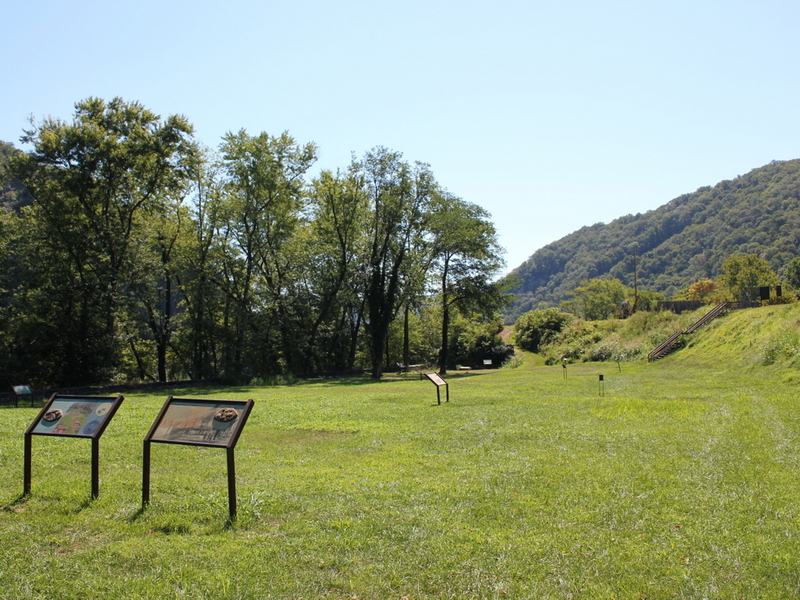 Today, this area is part of the Harpers Ferry National Historical Park, and although there are no buildings still standing here from the armory, the interpretive signs help to give visitors an idea of what was once here. Looking across the Potomac River toward Maryland from Harpers Ferry, around 1859. Image courtesy of the Library of Congress, Civil War Collection. Assuming the estimated date is correct, the first photo was probably taken within a few months before or after John Brown’s raid on the Harpers Ferry Armory. It shows the view from the Armory looking across the Potomac River toward Maryland Heights, with the Baltimore & Ohio Railroad bridge to the right. The Chesapeake & Ohio Canal also ran through this scene; the buildings across the river were built on either side of Lock 33. Within a few years, much of this scene would change. Harpers Ferry changed hands many times during the war, and during one of their retreats the Confederate forces burned the bridge, as seen in the 1861 photo in the previous post, which was taken from the opposite side of the river. The bridge has since been replaced several times, and the current one can be seen on the far right, a little upstream of the original one. The Chesapeake & Ohio Canal survived the war, and despite increased competition from railroads it remained in operation until 1924. 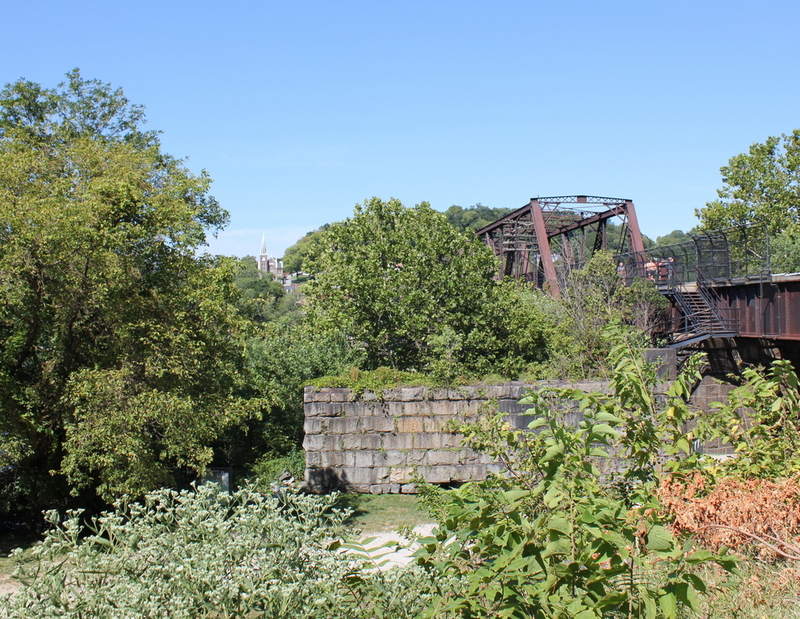 Today, the stone remains of Lock 33 are still standing, hidden from this view by the railroad bridge and the trees along the river. All of the buildings have long since disappeared, though, except for one: the two story stone house right up against the cliff on the left side of the photo. It was built in the winter of 1840-1841, and survived John Brown’s raid, the Civil War, and a number of floods before being gutted by a fire in the 1960s. The stone walls are still standing, though, and it is now part of the Harpers Ferry National Historical Park. One historical curiosity in the second photo is the advertisement painted on the rocks near the center of the photo. It reads “Mennen’s Borated Talcum Toilet Powder,” and it was painted in 1906 for railroad passengers as they traveled through here. Although not as distinct as it once was, the controversial advertisement is still there, despite efforts in the 1960s to remove it using paint remover and carbon black. Looking across the Potomac River towards Harpers Ferry from the Maryland side of the river, around June 14, 1861. Image courtesy of the Library of Congress, Civil War Collection. The town of Harpers Ferry had only about 1,300 residents at the start of the Civil War, and its land area was just a half a square mile, but it became among the most contested places of the war. It was literally located on the border of the Union and the Confederacy, changing hands eight times during the war and ending up in a different state by the time it was over. As its name implies, this area was first settled as a ferry crossing. Originally part of Virginia, it is located at the confluence of the Potomac and Shenandoah Rivers, and beginning in 1733 colonist Peter Stevens operated a ferry across the Potomac here, enabling settlers from Maryland and Pennsylvania to access the Shenandoah Valley of Virginia. The town isn’t named Stevens Ferry, though, because around 1748 he sold his land and ferry to Robert Harper, who operated it until his death in 1782. Because of its transportation connections and relatively defensible position, Harpers Ferry was one of two locations, along with Springfield, Massachusetts, selected by George Washington for federal armories. Further transportation developments came in the 1830s: the Chesapeake & Ohio Canal (seen in the lower foreground of both photos) was completed as far as Harpers Ferry in 1833, several stagecoach lines were opened in 1834, and the Baltimore & Ohio Railroad reached the Maryland (foreground) side of the river later in 1834. The first railroad bridge was completed in 1837, allowing a direct connection from the armory to the rapidly growing national rail network. By 1850, this small town had grown to over 1,700 people thanks to the armory (visible along the waterfront to the right in the first photo), but before the end of the decade it would become the center of one of the major precursors to the Civil War. In October 1859, abolitionist John Brown led a raiding party of 22 men in an attempt to capture the arsenal and start a slave rebellion. The raid ultimately failed, and most of the raiders were either killed or were captured and executed, including John Brown, whose December 2 execution was seen as a martyrdom by many northern abolitionists. When the first photo was taken, the town was still relatively intact, but as the war progressed it became somewhat of a no man’s land. Despite the loss of the armory, it was still a vital transportation corridor for armies on both sides, so between 1861 and 1863 it changed hands several more times. West Virginia became a state on June 20, 1863, with Harpers Ferry citizens voting 196 to 1 to leave Virginia and join the union. 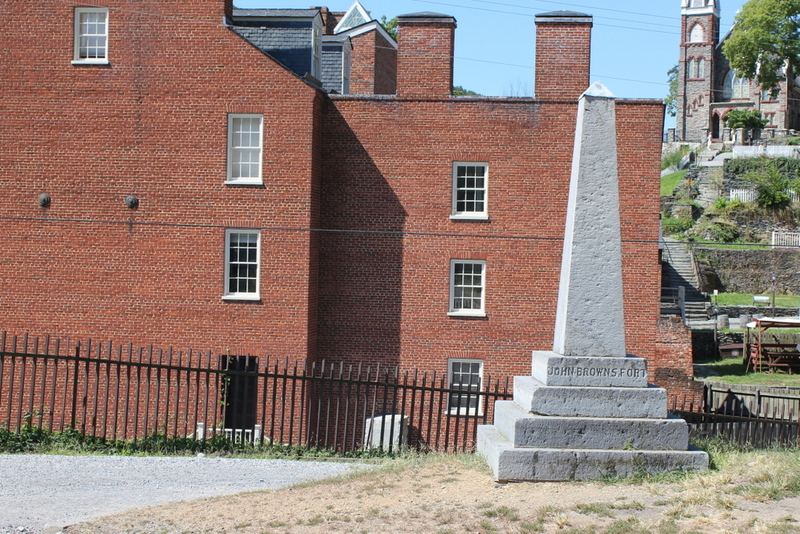 The town was briefly occupied by the Confederates in early July, but they soon evacuated for the last time and Union solders returned on July 13, finally bringing stability to Harpers Ferry for the rest of the war. In terms of population, Harpers Ferry never fully recovered from the Civil War. The armory never reopened, and the population has steadily fallen to less than 300 as of the 2015 census. However, it has become a major tourist destination, with the Harpers Ferry National Historic Park now comprising much of the historic town. Although the Chesapeake & Ohio Canal has not operated in nearly a century, there are still several railroad lines that pass through here. One of the bridges, seen to the right in the 2015 photo, also carries the Appalachian Trail over the Potomac River on a pedestrian walkway on the left side of the bridge. The bridge pier in the foreground is from an earlier railroad bridge that had been built on the spot of the one that was destroyed in 1861. This bridge, in turn, was washed away in a 1936 flood, and it was never rebuilt. 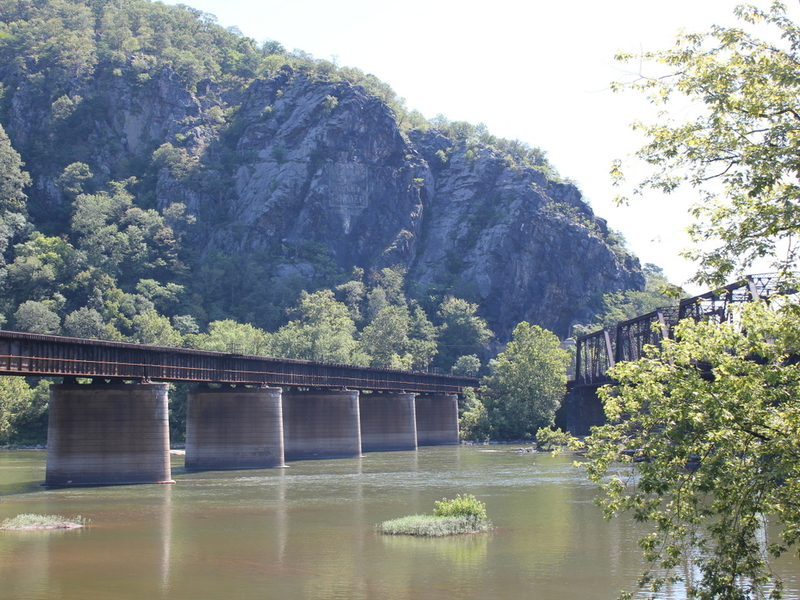 Today, the modern railroad bridge, as well as trees along the river, help to hide the view of Harpers Ferry, with only a few buildings visible in the 2015 scene. 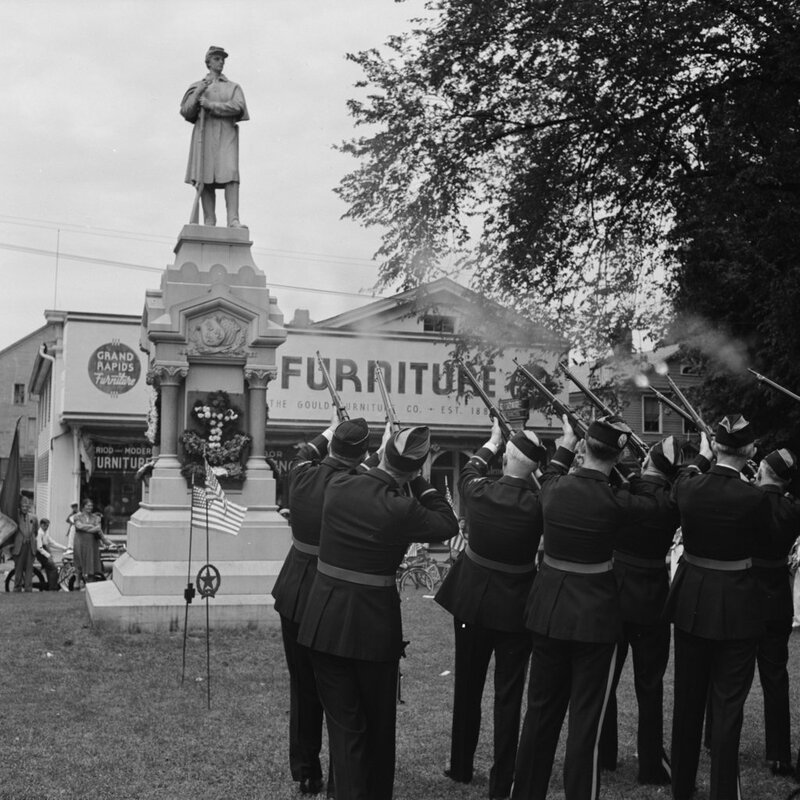 The Soldiers’ Monument in Southington during Memorial Day observances in May 1942. Image courtesy of the Library of Congress, FSA-OWI Collection. 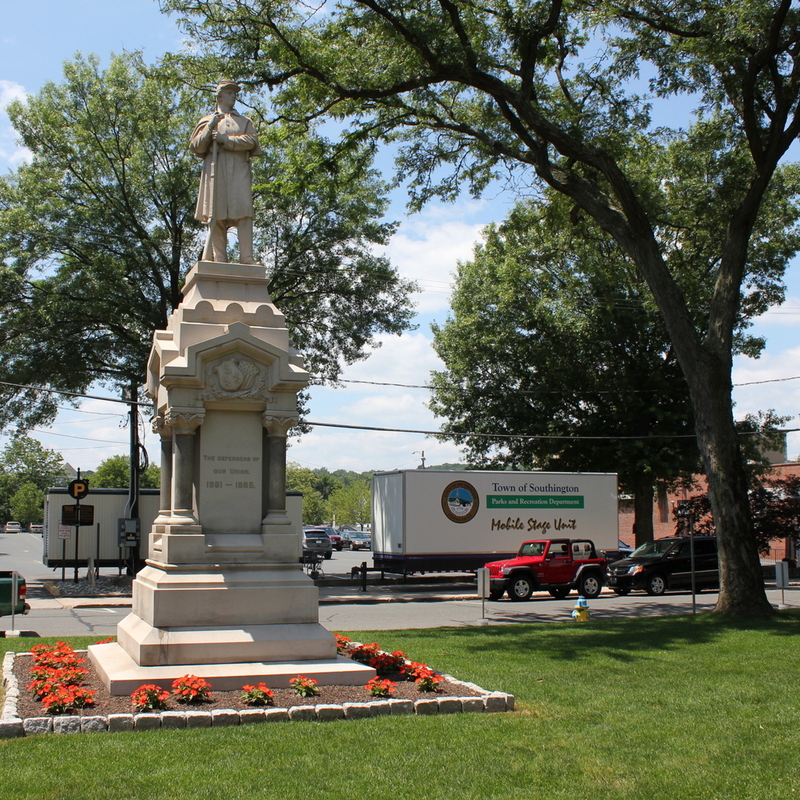 Today, the monument is still there, and nearby on the town common are several others in honor of men and women from Southington who served in World War I, World War II, Korea, and Vietnam. The surroundings, however, have changed. The 1942 photo shows the Grand Rapids Furniture store in the background, and to the left of it is a house. Both buildings are now gone, replaced by a parking lot today.